OK, so the question is not whether they cut their target tomorrow, but how far. The effective rate has been around 1% for a while.Â So a 50 basis point cut to 1% (deja vu) would simply ratify what is already happening. The futures options are pricing in that 50 bps.Â But you see that gray line making a late spike?Â That represents a 75 bps cut to 0.75%. This Fed is big on “inflation expectations”.Â How do you like this chart?Â Because I guarantee the Fed does not like it at all. I think they cut by 75 bps and very possibly 100.Â Today’s kilopoint Dow rally merely reinforces my conviction (maybe somebody leaked). P.S. As always, do not forget to say a prayer for Ben Bernanke (click on #6). Well, I am man enough to admit when I am wrong.Â They only cut 50 bps, as most people expected. I still think they go below 25 bps by March. It would not surprise me to see a larger cut. The 50 bps is already priced into the market. If they want to provoke a positive reaction in the market, they will have to do something more. They may just be relying on their special facilities to make an impact at this point, however. You have identified the risk to my Fedcast. If lower overnight rates would interfere with the special facilities… But that would mean they were still worried about “fully sterilizing” their injections. 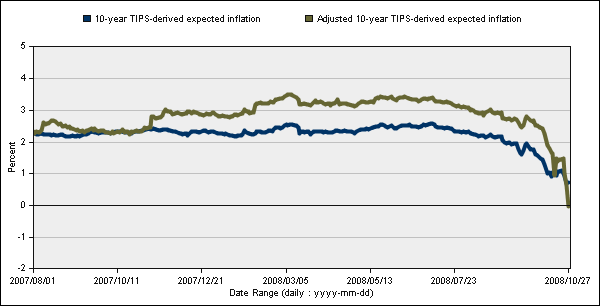 At this point, I believe the Fed is (much) more worried about deflation than inflation. They are simply flooding the system with liquidity, and I suspect they are prepared to do more. So they probably see no problem combining a lower overnight target with the other facilities. I could be wrong. Part of me just likes disagreeing with the futures.